What can you see through a celestial window? How does a weather station work? Can a ball dance on a jet of water? The 27-metre-high Turm der Lüfte (Tower of Skies), standing at the centre of the EntdeckerPark, has the answers to all these questions thanks to its numerous interactive attractions. 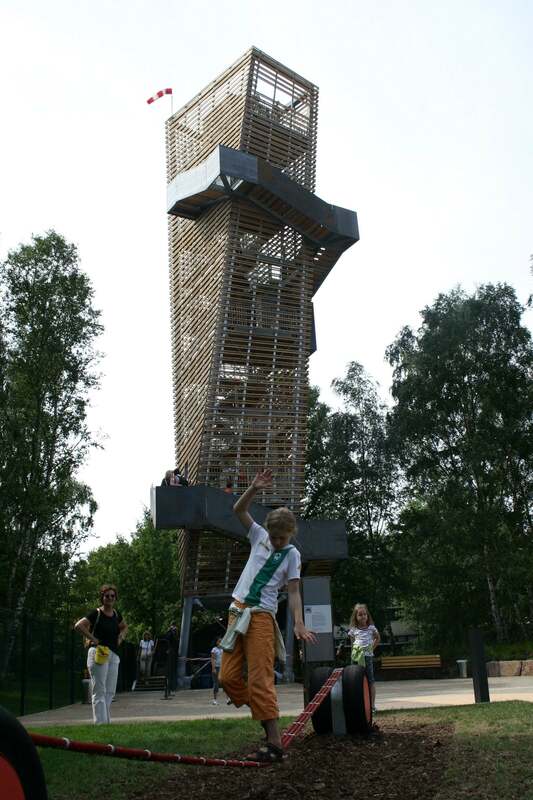 Visitors climbing the tower can not only catch their breath on its four intermediate levels, but also gain insights into the areas of energy and gravity, as well as wind and weather. A great deal happening on all levels! The first level, for example, features a bouncing ball pyramid. The bounciness of an ordinary rubber ball is just amazing! No less astonishing is the aqua yoyo, where a plastic ball is seen dancing on a water fountain. The first level is full of such fascinating exhibits, all of which are explained using short, vivid descriptions. Visitors to the second level will be astonished to find a walk-in steel box in which a plastic-strip wood makes the wind visible. Moreover, visitors can listen to a large wind harp that is vibrated by gusts of wind and generates peculiar sounds. On the third level visitors learn how wind strength can be measured using a simple metal flap. The rewards for visitors who make it to the fourth and highest level is a magnificent view of the EntdeckerPark, the Science Center, the Bürgerpark and the city centre. Looked at from this height, the theme park seems like a network of trails and vegetation areas, exhibits and objects. At the weather station, visitors can read the current wind speed and temperature measurements, and find out whether predicting tomorrow’s weather is difficult or not. Particularly impressive is the so-called celestial window: In a closed room, visitors lean back in their chairs to look through an opening in the ceiling directly at the sky, their perception of it enhanced by the framed outlook. The Turm der Lüfte is not only conceptually but also architecturally unique in Europe. It is made of galvanized steel and has a timber facing made of Siberian larch. The indoor and outdoor staircases are both made of glass, surprising visitors with the unusual downward views they are able to enjoy as a result. They also reinforce the tower’s image as a symbol of the transparency that is often demanded of science. Particularly striking, however, is the fact that the tower turns in on itself, with the viewing platform on its summit at an angle of 30 degrees to its foundations – a characteristic that will no doubt eventually earn it the nickname “The Twisted Tower of Bremen”, and possibly result in it becoming the symbol for the entire Technologie Park Bremen. Der 27 Meter hohe Turm der Lüfte wartet mit zahlreichen Experimentierstationen auf die Besucher.